Subject to the coat weight and application Delpro offers direct, reverse and offset gravure coaters or a multi gravure coater offering all three modes. Many advanced features are incorporated allowing extreme accuracy of coating and ease and speed of operation, particularly roll changes, change of coating width and change of coating mix. Rolls are pneumatically loaded against each other with a precision gap setting system with micrometer, backlash-free control adjusted by hand wheel or servo motor. Rubber covered offset or backing roll based upon a sleeve system to enable a change of coating width to be made within minutes. All rolls are independently driven to enable relative speeds of the rolls to be varied for coating quality and small weight adjustment with motors housed on a separate drive frame and connected via quick release Cardon-type couplings. Coating is applied to the gravure roll via Delpro carbon fibre doctor blade or open pan with trailing blade. 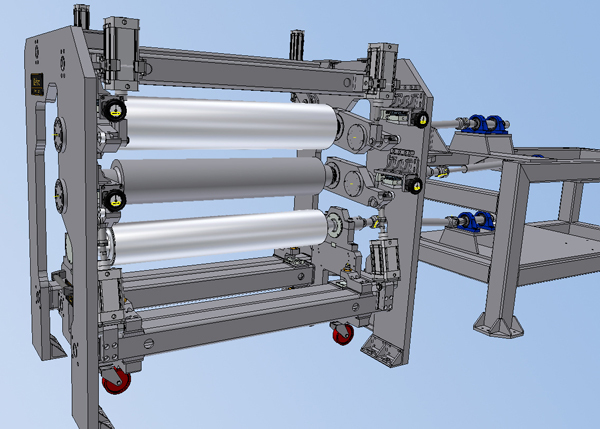 Trolley-mounted gravure roll enabling make ready and cleaning to be carried out off-machine thus minimising downtime.